Designed to help customer experience and marketing professionals create the perfect customer love story. This channel hosts webcasts which discuss best practices for understanding the voice of the customer, mapping customer journeys and personalizing the customer experience. Welcome to the dawn of anticipatory CX. Customer expectations are rising faster than companies can evolve their value propositions, creating unprecedented urgency among business leaders. Customer experience (CX) professionals need to expand their tool set to allow them to manage customer expectations as early as possible and to build and sustain positive emotional momentum throughout the journey. 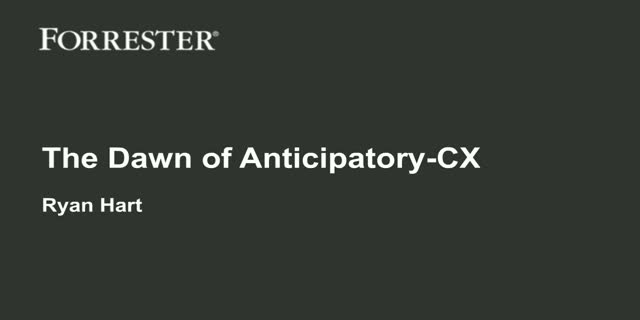 Join this webinar, to hear our guest speaker Ryan Hart, Principal Analyst at Forrester Research, explain how CX pros can use the power of anticipation and describe the best practices for creating more profound, more compelling experiences that sustain long-term impact. Join us for this webinar to learn about managing the change within your organization that launching your CX program demands. We’ll discuss how to assess your internal communication and training needs, which methods will be most effective for internal communications and how to manage key project stakeholders. We’ll also provide a sneak peek into one of our CX communication kits! Everyone is talking about a shift to digital, with mobile web and app capabilities offering simple, accessible services to customers whilst providing companies with opportunities to reduce support in contact centres. 24hr availability, no wait times, low cost to serve - what’s not to like? But can you really shift complex enquiries or support requests to these channels? And when you can’t manage something here what happens? Customers turn to the phone, or more accurately they reach the IVR, the gateway to the contact center. The IVR has in many cases become the poor relation, being ignored by most and dead to others (this demise is taking a long time right?). But in an age where customer experience is the differentiator, can you really afford to ignore the beginning of the call experience? Investment in IVR solutions may not be as easy to sell as glamorous digital transformation projects, so you may have to make the best of what you’ve got. The IVR accounts for 27% of overall call experience but only 7% of organizations invest in IVR to deliver a better experience. In this webinar we will remind you of all the reasons to love your IVR again, and show you how to pay it, and the customers who use it, the utmost attention. There are many key considerations when planning a CX program launch. In the next two webinars of our series, we’ll give you a detailed look at two of them. Join us for this webinar to learn more about CX program strategy. Our discussion will consider the values of your CX program, the business goals and how you will measure, execute and implement your CX program effectively within your organization. What type of Customer Experience leader are you? Celebrate CX Day with us, and learn how you can be the CX change agent within your organization. Which CX persona are you? Join us for this webinar, in which we will present the different CX personas. Gain insight into the characteristics, working demeanor and CX perspective of each. Take our quiz to find out which CX persona you are, and to understand those areas where you can help to lead and support the CX program within your organization. In the last 18 months Jon Cockcroft has overseen the delivery of Direct Line's "MyCustomer" Customer Feedback Strategy - utilising the NICE VOC solution - to 3,000 front line employees, across seven sites, driving improvement in both customer experience and NPS scores. He will share his story on the critical success factors and lessons learned in Direct Line's journey. How mature is your Customer Experience organization? Understanding where your organization is positioned in the customer experience (CX) maturity model is critical to designing the best strategy for improvement, and the first step you must take towards optimizing your organization’s overall CX program. Join this webinar to gain an understanding of the different modes and phases that comprise the CX maturity model, reasonable expectations for stakeholders in each stage of the program, how the program should be managed and what outcomes you can anticipate. In the final webinar in our series, we’ll tackle Return on Investment. Join us to gain an understanding of the many forms of ROI one might identify within a Customer Experience strategy, and to understand which first step your organization should take to best illustrate your program’s ROI. As your Customer Experience strategy proceeds, it’s important you don’t neglect a vital part of the equation: Often acting as the faces of your organization, your employees will inevitably have a considerable impact on the experience your customers have. Join us for the eighth webinar in our series and learn how to ensure employees are not only engaged with, but actively promoting, the customer-centric culture you’ve established within your organization. You’ve effectively established a customer-centric culture within your organization, and everyone is working towards the same goal of improving the Customer Experience. But where is the best place to start? Join the sixth webinar in our series, as we weigh the pros and cons of focusing your Customer Experience strategy towards improving bad customer experiences, versus creating good ones.